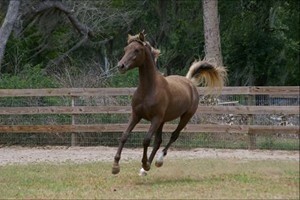 WelBreds Dream Genie as a yearling. 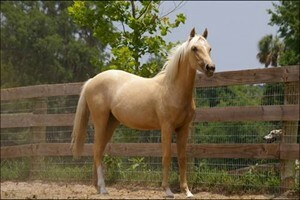 She shed out to a chocolate color with flaxen mane and tail, very sharp! 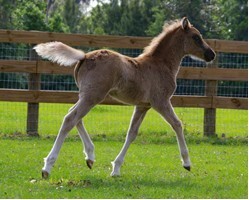 This filly we call Dream Genie and she is a dream! 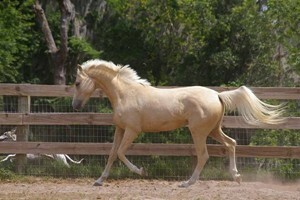 Her dam is a black Arabian and her sire is our cremello Welsh sec. A champion producer “Crème de Mint”. 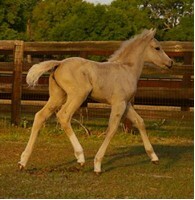 This filly inherited the silver dapple gene from her sire so she can produce all the fancy colors as a broodmare (silver dapple, palomino or buckskin). 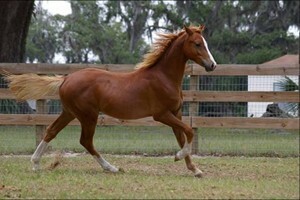 She is flawless and will be a top pony in whatever discipline she goes into. 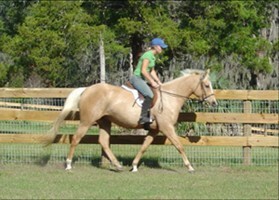 We expect her to top out around 13.2 She can be registered both half Welsh, half Arabian, and as a Florida Bred Pony. SOLD. 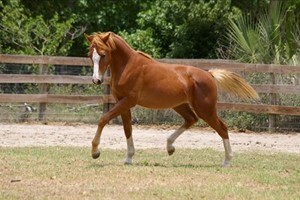 WelBreds Moment of Truth is out of a jockey club TB and by our “Crème de Mint” Welsh sec A cremello stallion. 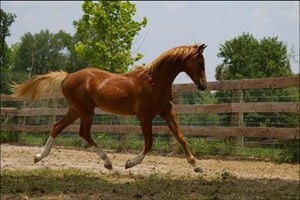 With wonderful conformation, big movement, pretty color and a loving personality, she is going to be a very fancy girl. 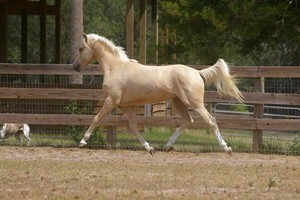 It is hard to find the Welsh x TB with this quality and color. 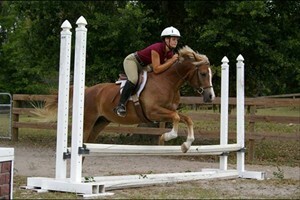 She has been out to the shows and acted like a pro. 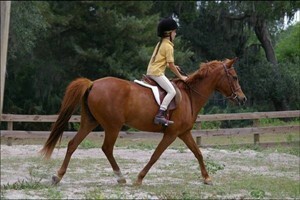 She will mature a large pony. 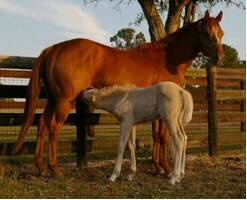 The dam is 15h and sire 12h. 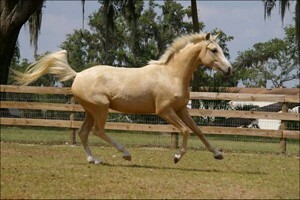 This athletic palomino boy is WelBreds Sahara Gold and he is out of one of our best mares (TB x QH) who will be showing this year and by Crème de Mint our Welsh sec. 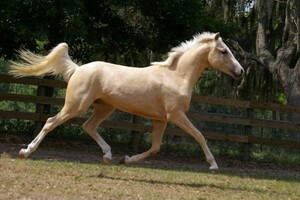 A stallion. 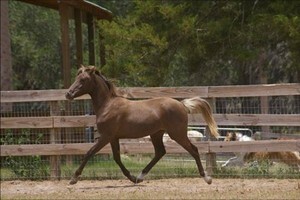 He is in training now and does parelli games and has been backed several times. He will be a serious contender for any discipline. 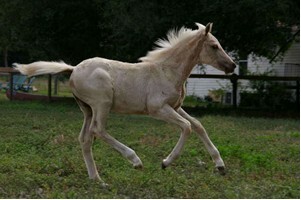 This pony is expected to be just over 14h – he will not go over pony size. 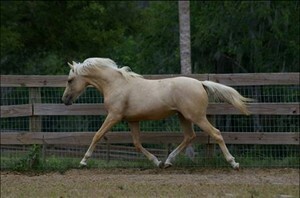 This breeding has been repeated for 2007 for a full sibling. 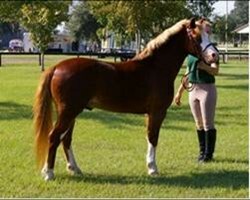 This gelding is WelBreds Show Bizz and he is by our Welsh sec. 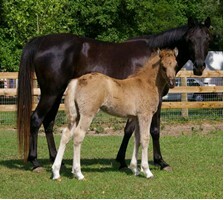 A. international champion Heritage Hall Razzle Dazzle (shown above with handler) and out of the lovely Anglo-Arab mare pictured above with Show Bizz as a baby. With those parents he can’t miss. 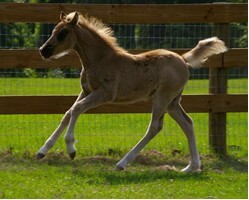 He has daddy’s in your pocket attitude and mommy’s elegance. 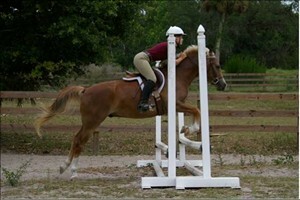 He has been to his first show and pinned first over fences. 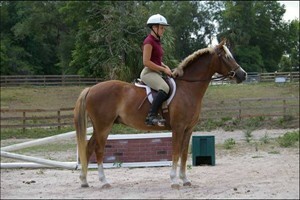 He also pinned in the model classes and equitation. He is 13.1h. And will be a top of the line medium. See him at HITS next year. 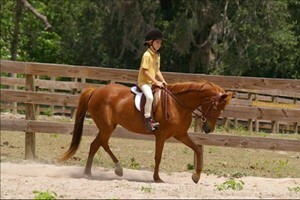 This A circuit pony is being groomed for my grandaughter but may be sold for the right price. He is both cute and safe! 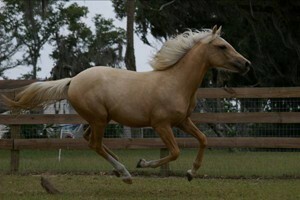 This five year old top of the line large pony palomino mare is just now getting out to the shows. She pinned in the unrated week at HITS and will be ready for the rated shows next year. 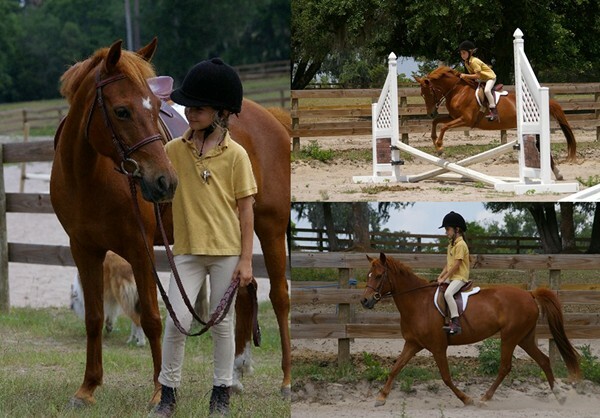 The picture on the right is the first week she had been backed and the one on the left at HITS. She is a T.B. 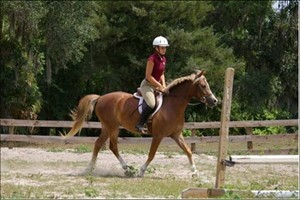 cross with great movement and conformation. She is looking for a talented junior to take her all the way. We will be adding pictures of her later. 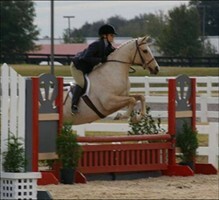 All her indoor arena show pictures did not come out well. 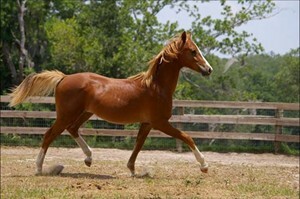 In training until sold. 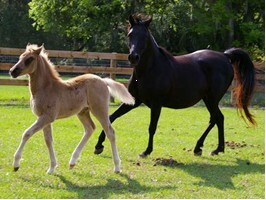 Will add more pictures as the babies are born.